A whole industry has developed around keeping kids safe in play areas. Soft fall has become big business, and Landscape contractors should be central to their construction. Rubber mats and wet pour rubber are widely used as a safe surface for playgrounds. Mulch is another option, but what types are best? Why is turf by itself not allowed and what options are available for using real grass? New research has provided Landscapers with an approved option for using green life in a soft fall area, allowing Landscapers to create a green space in fall zones. 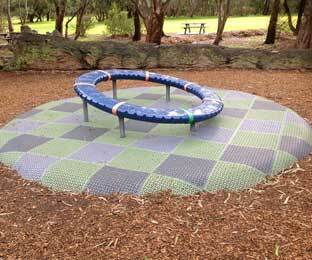 Soft fall surfacing is required to meet Australian Standards for Playground Safety. 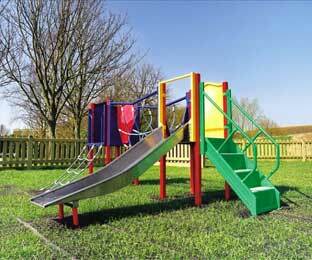 The level and type of soft fall you require will be determined by the play equipment you choose for your area. Soft fall surfacing need only be installed to the required fall zone area of the play equipment, the remaining play area may utilise standard landscape options like turf. One very popular surface for fall zones is wet pour rubber. Wet pour is the process involved in laying rubber products. It is an in situ product which basically means the products are mixed on site and then hand-troweled. The process is very similar to asphalting or concreting. Colours are used to make the surface more visually appealing. To have the product approved, all soft fall options need to be tested by an accredited tester, and must meet Australian standards. The Australian Standard AS/NZS 4422:1996 specifies testing requirements that will determine the Critical Fall Height for playground safety equipment. This height is determined by dropping an instrument from various heights onto surfaces and measuring the point where one of the two safety criteria are exceeded. Different thicknesses and types of soft fall determine the critical fall height and thus the height the playground equipment can be. Another soft fall option comes in the form of rubber tiles. The best known system is from Play Matta. Play Matta™ Original tiles can be installed over prepared or most existing hard surfaces, including gentle contours and is immediately compliant and ready for use, providing children with a safe playing surface. Play Matta™ Original Systems have a choice of shock pads and tests show excellent results for impact reduction of up to 4.5 meters for the A+A shock pad system. These self-draining tiles have a non-slip surface for good traction levels in wet and dry conditions and comply with disabled accessibility requirements. The true benefit of this system is longevity. The real cost of playground surfacing is not just the initial outlay, but the cost of ongoing maintenance, the cost of repairs and the cost of replacement when the surfacing reaches the end of its life. Using a system that lasts longer makes sense. Decade’s earlier live turf was commonly used as soft fall. Live turf does pass most soft fall tests, but unfortunately when or if the turf dies, a hard compacted surface that is non-compliant is left behind. So plastic grass has become another widely used system. The key here is to have the subsurface compliant with the standards, and many companies specialise in this. If you want real grass, there is however now an alternative. Play Matta have recently released a Grass Tile system that is compliant to the Australian standards. It has a soft base, and a covering mat, and so even if the turf fails, a compliant usable and nice looking surface is left behind. The key to keeping turf alive in this system is to use a really tough highly rhizotomous and hard wearing turf. The mat helps protect the turf from wear. Kikuyu turf is by far the best turf choice, and recent turf breeding has provided a far more suitable Kikuyu. KENDA® Kikuyu has 4 times as many underground runners as the common form, and is more vigorous in horizontal growth. Without the extensive rhizomes this system will not work. Mulch is another option for soft fall. Not just any old mulch, you need a mulch that is compliant, but luckily there are a number available. In recent trials a pine bark mulch however showed less slumpage, probably making it the best choice for lower maintenance. Until recently, it was not allowed to use plants in soft fall zones. Now however ground breaking research lets landscape professionals create green soft fall areas. Methods implemented by Ozbreed and Fiona Robbé Landscape Architects help create more natural playspaces, which meet the Australian Standard and have won an award at the Kidsafe 2012 National Playspace Design Awards. Ozbreed, in conjunction with Fiona Robbé Landscape Architects, found a need to make playgrounds more natural, as kids love playing in playgrounds and quite often wonder off exploring their surrounds. Kids also love playing with plants, and this should be considered more so by Landscape Architects and Designers whilst still ensuring an optimum safe play environment. The increasing demand and interest in the performance of non-woody plants in mulch in and around play equipment, including fall zones, set the premise for this trial. The main aim of the trial was to systematically determine the optimum growth conditions for non-woody plants in playground mulch. This will allow playgrounds to look more natural and reduce the open bare appearance of play equipment without compromising safety. Two garden beds were utilised in the trial, containing two different mulches; Playbark Pinebark Mulch and Port Stephens Pine Mulch. Naringa™ Westringia ‘WES01′ PBR and Tanika® Lomandra longifolia ‘LM300’ PBR, were installed in each garden bed and planted in two different sets of conditions: Planted in pure mulch and planted with soil underneath (soil base method). Results showed that plants with soil underneath established and rooted out much quicker than the plants planted straight into the mulch. Tanika® and Naringa™ plants rooted out quicker, and Tanika® Lomandra showed a better growth habit in the soil base method and the foliage looked cleaner. Results 3 years later showed that the plants continued to thrive. They actually seemed healthier and had grown more than the control plants in the surrounding ground without mulch. Overall it was noted that the plants survived and performed better in the soil base method conditions. This is quite important to note within the playground environment as when planted this way they will have a much better chance of surviving harsh wear and tear from kids and pets. Fall height testing was also conducted to determine the Critical Fall Height (CFH) for “Under Playground Surfacing with Plants” in accordance with the Australian test method AS/NZS4422:1996. Fall height tests were completed on the bark mulch areas, including tests on the plants installed within these mulches. It was found that the two types of bark mulches and plant combination passed the testing with a result of the Critical Fall Height (CFH) minimum for the two complete areas of at least 3.2 metres, deducing that these conditions now meet strict Australian Standards. It’s important to note that although Naringa™ Westringia passed the drop tests, the branches could be a hazard if a child fell on it, so Tanika® Lomandra would be safer option for planting in fall zones. Thanks to this research, whole arrays of planting options are now available for soft fall areas. Rubber, and rubber mats can still be used by simply having small mulched areas in the soft fall zone, or by simply leaving out one mat and planting Tanika® Lomandra in it. With the growing use of live plants and turf in soft fall zones, Landscapers will play a more important role in soft fall installation, which equates to more work for the Landscape professional.